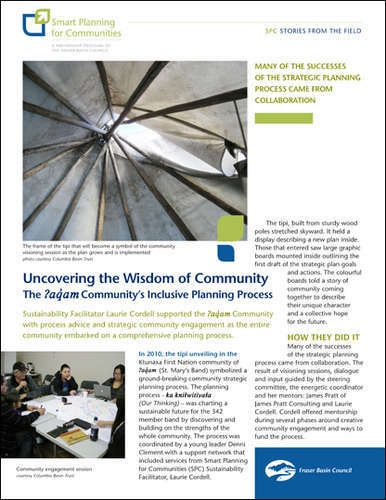 The ?Aq'am Community consulted with the Smart Planning for Communities program about process advice and strategic community engagement as the entire community embarked on a comprehensive planning process. 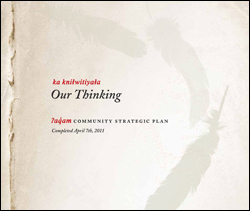 In 2010, the tipi unveiling in the Ktunaxa First Nation community of ?Aq’am (St. Mary’s Band) symbolized a ground-breaking community strategic planning process. 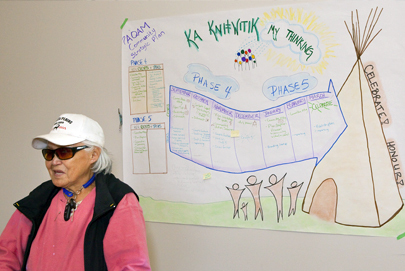 The planning process – ka knilwitiyala (Our Thinking) – was charting a sustainable future for the 342 member band by discovering and building on the strengths of the whole community. The process was coordinated by a young leader Denni Clement with a support network that included services from Smart Planning for Communities (SPC) Sustainability Facilitator, Laurie Cordell. 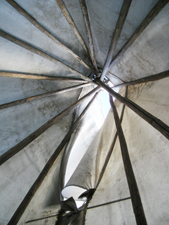 The tipi, built from sturdy wood poles stretched skyward. It held a display describing a new plan inside. 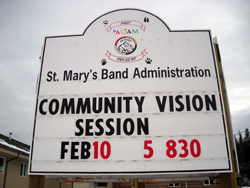 Those that entered saw large graphic boards mounted inside outlining the first draft of the strategic plan goals and actions. The colourful boards told a story of community coming together to describe their unique character and a collective hope for the future. Many of the successes of the strategic planning process came from collaboration. The result of visioning sessions, dialogue and input guided by the steering committee, the energetic coordinator and her mentors: James Pratt of James Pratt Consulting and Laurie Cordell. Cordell offered mentorship during several phases around creative community engagement and ways to fund the process. The first phase involved research, pre-planning and initial consultation. Indian and Northern Affairs (INAC) provided first-phase funding. After this part of the workplan was complete the Band was prepared for a deep engagement phase. Armed with advice and smart practices on the best ways to bring the community together, they were ready to launch an extensive public engagement campaign. However, there was one large problem – part of the funding they were initially relying on did not come through. With assistance from Cordell, Clement coordinated an application for funding to Columbia Basin Trust (CBT). The proposal was accepted. 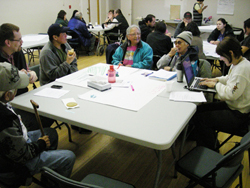 With joint funds from The Ktunaxa Nation Council and INAC the engagement process was launched. The outreach efforts included community visioning workshops where they collected key ideas through word association and discussion. Cordell helped create graphic handouts that helped guide future sessions. Clement made it a priority to reach different demographics. "We wanted everyone to be involved. We reached out to Youth and had family meetings to reach those who don’t like big meetings, I went to the schools, to elders one-on-one and the general public. The community meetings were designed to be fun, empowering, and interesting." There was always food available at the bigger community meetings along with day care and prize draws. In order to reach the youth in the community Clement brough pizza to the high school at lunch. She decided to run a cinematography workshop to explore on film the community’s vision of sustainability. They didn’t know how to run this kind of workshop or make a film. Laurie Cordell connected them with "REEL YOUTH" (http://reelyouth.ca/) a not-for-profit, media empowerment program supporting young people to create and distribute films about their visions for a more just and sustainable world. 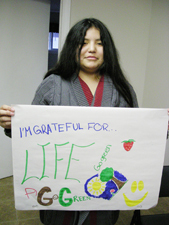 Reel Youth came to the community through funding acquired through the CBT grant. Once outreach and visioning were complete and clear themes were established, the community moved on to creating goals and objectives for each planning area. The community came together for a community trek in Kootenay National Park, their traditional territory, to present and get feedback on the second draft of the plan. The topic areas that emerged from the engagement process pointed to specific goals and objectives for each planning focus areas. Their thinking was being documented and the plan, ka knilwitiyala, took shape. As the plan developed, SPC continued to help them with expertise around the planning process along with advice on community engagement and sustainability. Cordell sat down with Clement to review the last phases and created a visual by drawing out the process together on a large sheet of paper. "This helped her to lay out the process clearly with a component of time." remembered Cordell. The illustration of the process is now hanging in Denni’s office. "She helped me to create a big graphic that mapped out the next phases of our process because that was very unclear. We use it to talk to community members so they can visually see what we need to do," explained Clement. "The framework for our plan is the tipi and each area of focus a pole. "It is the start of an ongoing process of development. The ?a'qam Strategic plan will be a living breathing document that will be reviewed and updated annually or as needed." The process was not only a way to form a plan, it also reconnected the community and organized them to move towards a common vision. Denni Clement reflected, "I think the whole planning process is amazing. It has helped to bring our community together...it was healing, we looked at who we are." Denni Clement’s role evolved into uncovering and pulling together the wisdom of the community. She feels that the plan was there – it just needed someone to weave it all together. What they discovered was common vision. It is recorded in the plan; "A vibrant, healthy community, speaking our language, governing effectively, maximizing our lands and resources for the benefit of all living things and future generations, in a manner consistent with qanikit’i (our values and principles)." "The current chief, Cheryl Casimer, and Council originally decided we needed this Plan so we could be more proactive than reactive and so that we could work together," said Clement. The process became a chance for the Chief and Council to be led by the wishes of the community. The process was facilitated by Coordinator Denni Clement with the Strategic Planning Advisory Committee, consultant James Pratt with support from the Columbia Basin Trust and Smart Planning for Communities mentorship. Laurie Cordell felt she helped the most by providing a fresh perspective and an additional layer of support. "Denni was the one discovering it and putting it [the plan] together for the community, I just helped her along." Laurie assisted with securing a $40,000 grant through CBT by creating linkages and supporting their funding application. Cordell also emphasized relationship building and brought technical planning knowledge when the community needed it to moved forward, for example by reviewing the plan and sharing examples with other communities. Clement found the strategic support, the education and training and links to resources online was useful. "To have support through this whole process has been so great because there is so much work to be done and it can be very emotional and you need help. I needed help. It is very important to have that support." Laurie Cordell is SPC’s Southeastern BC Sustainability Facilitator – bringing 12 years of planning experience at the federal, regional district and municipal levels. With a strong interest in sustainability, Laurie has extensive experience related to planning processes and a passion for creative community engagement. In her previous roles as Municipal and Regional Planner, she was responsible for a wide array of community planning including greenhouse gas mitigation, affordable housing, climate adaptation and development of Official Community Plans. Laurie appreciates the communities and natural beauty of British Columbia. She currently lives in the Kootenays in an off-grid, solar house. Download a pdf of this Story from the Field.